As we’ve stated before in our blog here at Jonathan The Drone Guy, drones are nothing new. UAV technology has existed for decades, and the military has been utilizing this tech for quite some time at this point. Now, while drones have very established uses in today’s ever-changing world, what’s really cool is that they show practically infinite potential in shaping a better tomorrow. It’s true that drones can be used for more sinister purposes, but Jonathan prefers to take an optimistic and personalized approach to his drone photography services in Los Angeles. With his drone wedding video capabilities, he can capture your special day from a unique perspective. With a distinct background in real estate, Jonathan makes real estate drone photography and video a total breeze down here in the Los Angeles area. Need to shoot a music video or multimedia project with a drone? Jonathan has you covered. Below, we’ll capture just a sliver of the seemingly limitless applications for drones in today’s modern world. If you’re looking for a friendly, professional and expert approach to drone photography and drone video in Los Angeles, talk to Jonathan today about how he can help make your visions come alive! Drones are widely used for aerial landscape photography and capturing extreme footage of places that aren’t easily accessible to man. These days, however, drones can be used to map out the terrain of mountainsides with remarkable detail. A company called SenseFly, acquired by Parrot, successfully mapped an entire face of the Matterhorn, which helps climbers and skiers better understand the unique terrain of the mountain. When the human eye fails to quickly spot someone in a search and rescue scenario, drones come to the rescue — literally. Fitted with thermal imaging technology, an unmanned drone can identify the location of a victim in a mere fraction of the time than a human could. Land Rover and the Austrian Red Cross cleverly partnered together to create a special operations vehicle that serves as somewhat of a mobile drone landing pad. Yes, the drone can land on the SUV while it’s in motion! We think that’s really neat. More than ever before, drones have allowed wildlife researchers to get close to animals without actually disturbing them with their human presence. This helps ensure that we can study migration patterns, identify any anomalies, and even fight against poaching. While recent efforts over the last several decades have sought to reduce the amount of waste and trash in our oceans, drones have been developed to go out, “swim,” and collect waste in a number of ports and harbors around the world. That’s a definitive win for the environment, or at the very least, a good step in the right direction. 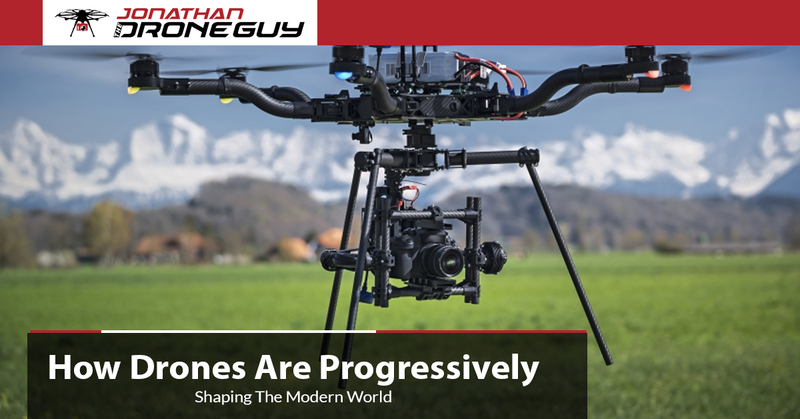 Innovate Your World With Jonathan The Drone Guy! When you work with Jonathan’s Los Angeles drone video services, the creative and practical possibilities are endless. Get started today.